Another month has gone by and another round of Windows Updates by Microsoft is causing more issues for users. The Windows 10 October 2018 was pulled the same week it was released because it was deleting users folders and files (which has been resolved and re-released). The latest October 2018-10 Cumulative Update seems to have made some computers audio not working and giving them a “No Audio Devices Installed” message. There have been numerous reports on Reddit, Twitter, and Microsoft’s own forums, but there has been no official response from Microsoft as of this article. 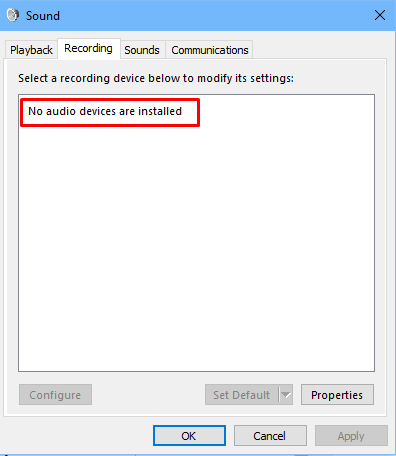 Some users have reported that following these steps has resolved their audio issues in Windows 10. If the above steps didn’t resolve your issue, you could try the Windows 10 Troubleshooter. Performing the steps above basically replaces your specific audio driver with a generic one, so you may only want to do it as a temporary solution. You’ll also want to make sure your volume is turned up and that the correct output device is selected when clicking on the volume icon by the clock. We’ll keep watch for any updates from Microsoft and update the article if more information becomes available. As always, let us know in the comments below whether the steps above helped fix your audio issues in Windows 10 or if you found a different solution.